Martha Raleigh Winsten's mother Sheila Raleigh painted this portrait of her as a child. Henry Patrick Raleigh, famed illustrator in his studio. He is Saratoga County resident Martha Raleigh Winsten's grandfather. Artist Martha Raleigh Winsten shares stories about her storied life from her Saratoga County home in late May. Artistic cousins Nora Raleigh Baskin, left, and Martha Raleigh Winsten spend time visiting in Glens Falls. Nora, a novelist, lives in Connecticut but based one of her novels in Glens Falls after a visit with Martha. Martha Raleigh Winsten painted this portrait of racehorse Silver Wagon. A recent book about Henry Patrick Raleigh, famed illustrator. A portrait of champion racehorse La Prevoyante. Martha Raleigh Winsten's mother's self portrait. Martha Raleigh Winsten painted Sula, one of her beloved dogs. Martha Raleigh Winsten's son, Michael Raleigh Winsten, and his beloved dog, Fox. Martha Raleigh Winsten's mother Sheila Raleigh painted this New York bridge in several seasons. The artist's proof, lithograph used for Chinese famine posters in the 1920s. This recent book, "nine, ten: a September 11 story," by Nora Raleigh Baskin has received critical acclaim and awards. Nora Raleigh Baskin's sister, Alison, created this cake for their father's 82nd birthday. GANSEVOORT — On a cool late May evening, Martha Raleigh Winsten is waiting outside her nearly 200-year-old home that’s hidden behind towering ancient trees and sits on a lightly traveled side road off state Route 9 in Saratoga County. To ward off the chill, Martha cuddles inside a heavy dark brown fleece jacket. And luckily, on this night, there are no mosquitoes. Her day has been preoccupied with a mother raccoon and her babies who are living in one of the craggy old trees just to the left of her front porch. Still worried, she recounts the events of the day and the day before. “Something doesn’t seem right,” she said, concerned about the mother and wondering if she is rabid. A wildlife rehabilitator who checked the mother out the day before said she looked OK, Martha said. But now the mother raccoon moved the babies to another tree and her overnight behavior still seemed awry. Martha is worried about her dogs and her indoor-outdoor cats. The conversation drifts to stories of other raccoons over the years as she leads the way. Barely inside, a sweet little dog, Dandy, saved from death row last year, is right there with a scruffy, smiling greeting that feels a bit like a seasoned New York City concierge at an offbeat hotel. Martha says that when her mother and brother were alive and living with her in this historic home that they moved to from Connecticut in 1966, many animals shared the home with them over the years. Once well inside the front hallway, with its slightly skewed narrow staircase, common to homes from that era, the branches upon branches of breathtaking art seem to extend from one piece to the next, making it hard to consume it all at once. Each piece, riveting in content and creation, begs the viewer to linger longer. But there are so many to cling to, it’s hard decide where to stop first or to come up with any type of organized scan. What makes it even more stunning is that this home is not adorned with the art of strangers; this is Martha Raleigh Winsten’s art, her grandfather’s art, her mother’s art and the art of the rest of the Raleigh family, a veritable trove that houses lifetimes of creating. Much like the elegant Moreton Bay fig tree, anchored in fertile soil by a deep center core and detailed by above-ground columnar roots of linking fluid folds, Martha and her family have branched off the artistic plantings of her grandfather, famed illustrator Henry Patrick Raleigh, who chronicled the Gatsby era in thousands of illustrations. So this legacy of creation made the arts an acceptable and noble path. And the work of their grandfather now hangs in their own family homes, in private collections and in prestigious galleries, including an etching and illustration in the Hyde Museum collection in Glens Falls. 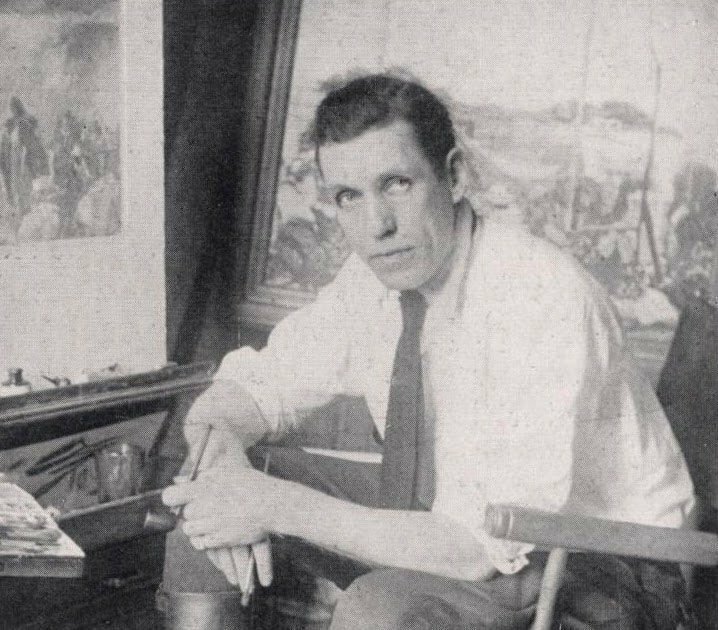 Inducted into the Society of Illustrators Hall of Fame in 1982, Henry Patrick Raleigh’s rough beginnings informed his work and propelled him forward. By age 17, long before newspapers used photographers to depict crime scenes, he began covering fires, floods and murders and illustrating the breaking news for the San Francisco Bulletin. He moved up quickly and assignments led him to New York City where he illustrated ads and stories for such magazines as Vanity Fair, Harper’s Bazaar, Collier’s and Saturday Evening Post. He founded the Westport, Connecticut art colony and for nearly 30 years, the Saturday Evening Post hired him to illustrate stories by F. Scott Fitzgerald, Agatha Christie, Stephen Vincent Benet, William Faulkner, Sinclair Lewis and Somerset Maugham. Nonetheless, by the 1940s, photography pushed illustrations from print publications and Henry Patrick Raleigh struggled financially, unable to find work. In 1944 (although some accounts report 1945), he threw himself to his death from a window of a Times Square hotel. Martha offers to sing a song she wrote about Sula, a dog she loved and still misses. She sits in one chair at the back edge of the grand piano with her guitar. Two small dogs, the concierge and Missy, nap curled together in a chair right near her knee. “Your memory will always remain dear … Sula, hope we meet again one day and walk together to heaven’s fields … your memory will always remain dear,” Martha sings in tones that mirror those of the legendary folk artist Judy Collins. The song of Sula leads to one about Cody Coyote, Templeton the Ratty Tat Tat Rat and Elija, the little brown calf, who is also the main character in one of Martha’s children’s books, . Every piece of Martha’s life is tattooed with her animals and her art, much of it blending together. There are the pen-and-ink note cards adorned with black-and-white dotted guinea fowl feathers from the guinea fowl that sits quietly in a cage on the sun porch; there are the illustrations of political issues, especially when they relate to the environment; and there are pastels, oils and acrylics, many seeming to combine an animal with a human. The daughter of legendary New York Post movie critic Archer Winsten and Sheila Raleigh Winsten, Martha lived a life often reserved for films and great novels. And much of it has the air of a legacy of royalty. And from a very young age, her mother had her painting. As an aside, she shared that while attending Bard College, she played tennis with Chevy Chase and did sketches of Donald Fagen of the band Steely Dan. Of late, Martha has been painting portraits of famous racehorses.